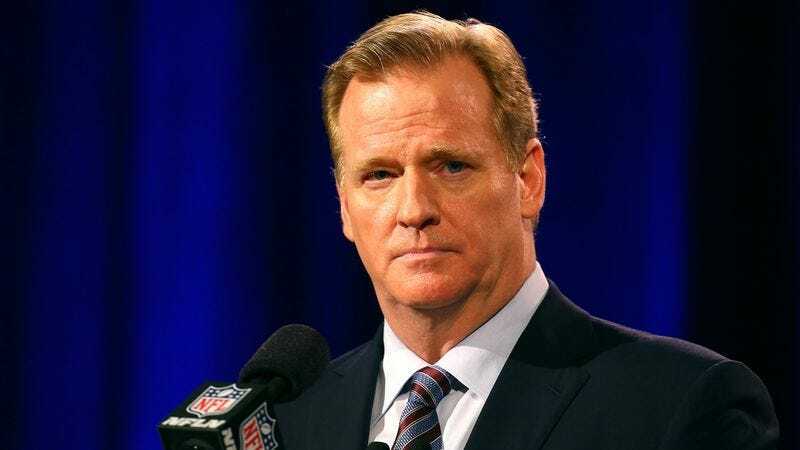 NEW YORK—Stressing that the new policy would be effective immediately, NFL commissioner Roger Goodell announced Tuesday that the league will strictly prohibit family members from delivering remarks at players’ funerals. “After careful consideration, we have determined that eulogies for players who have passed away will no longer be given by family and friends,” said Goodell, adding that an NFL representative will instead issue a brief eight- to 10-minute speech honoring the deceased as the coffin is lowered into the ground. “Family will be allowed to stand next to the gravestone during the tribute, but will not be permitted to deliver any additional comments to the crowd of mourners. Should they wish to be more involved, however, the next of kin are welcome to read a spiritual passage or lead the service in a prayer, provided they are selected from our list of acceptable options.” Goodell also confirmed that all epitaphs must be submitted to the league for final approval, while cemetery plots will be restricted to flowers and a single black-and-white photograph of the late player smiling in his team uniform.